How does the Automatic Intuition Professional course compare to other intuitive training programs? I receive a lot of emails asking me how my training is different from other psychic development programs. Many of these queries ask me to contrast my content and teaching style with the work of some very dear friends of mine. I can only be supportive of the work of my peers. We've all studied a lot of different modalities. We all tend to have multiple teachers. We all end up with a mix-and-matched hodgepodge of techniques and wisdom. I call this your Toolbox or your Box of Crayons. You may think the bag of tricks you've accumulated over a lifetime looks like a "mess" -- I prefer the words "eclectic" and "diverse." This is a powerful thing. You have a lot to pull from. Your practice is a mosaic, a collage. My overarching intention is that you can use Automatic Intuition Professional along with any other training or modality you have studied or may want to study in the future. YOU are the unique force that binds it all together. As I was working to develop this program, I went to a lot of other teachers' workshops. How would I improve on this experience? Is there anything I can add to this collective wisdom? What is missing for me as a student? How could I offer something unique as a teacher? I have to be honest, sometimes I felt the same way I always feel in classes and groups -- that I don't really fit in. All my life, I felt like the Goldilocks of Spiritual Development : "This teaching is too out there. This teaching is too dull. I like this part, but the other stuff turns me off. This feels a little hokey. There's not enough magic in this one..."
Have you ever been to one of these training workshops and found that the entire course is dependent on, say, clairvoyance... and that's not your strength? Or there's a dependence on some tool like reading cards or using a pendulum and if you're not comfortable with those tools, you're kinda left watching from the sidelines. I decided that my training program would champion your uniqueness. Not only what your strengths are, but the eclectic, diverse, weird and wacky way that you combine and use psychic abilities that looks like no one else's practice. I don't know of any psychic training program that offers as much in the way of personal coaching. Starting with 3 hours minimum and usually ending up being closer to 6 hours of personal time with me, our calls are where we customize the course just for you. I only list the coaching calls as a tiny sentence at the bottom of the course description, but the private sessions with me are truly the jewel in the crown of the work that I do. It's one aspect that gets excellent reviews and feedback, time and time again. The goal -- the end game, here -- is not for you to be a Mini-Slade or to become an Emissary of the House of Slade. Whatever. Something about that feels... a bit insulting. But what you can say is that I was the person -- who was already very successful at doing something similar to what you wanted to accomplish -- who gave you that gentle shove into living your purpose at a new level. I took you by the hand, showed you my entire operation, behind the scenes. I walked you backstage, demystified what works in my practice and what doesn't, and gave you at least a five-year step up in experience. Your dream of having a professional spiritual practice went from overwhelming and vague to simple and practical in just a couple of months. There is only so much that can go in a "workbook" -- everyone is different. 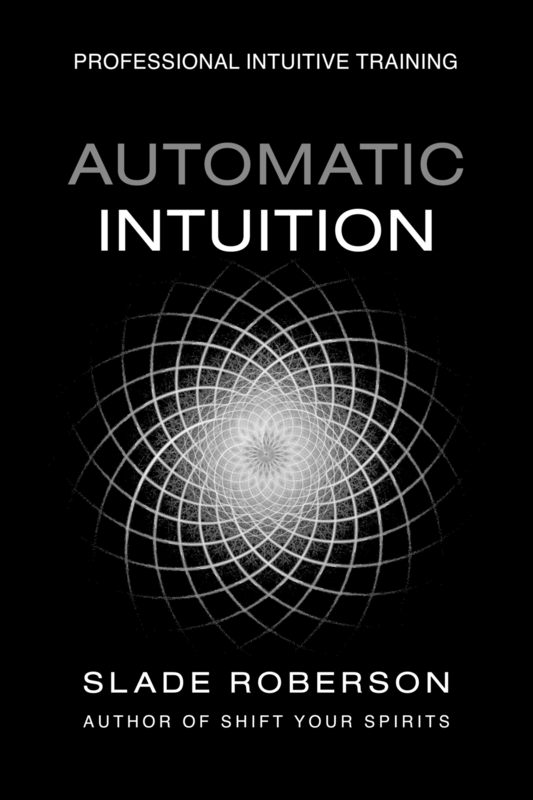 Automatic Intuition Professional is offered with the intention not to teach you how to do my readings, but to support you in developing your own unique, eclectic practice that looks like no one else's but yours. What I'm talking about feels familiar to you. You recognize yourself at soul level here. You've wanted to do this for awhile now. If you're meant to do it, you will. These things have a way of being divinely timed.